Songkran in Bangkok has lots to offer. Join the ‘world’s largest water fight’, or revel in the authentic customs of Songkran in Thailand. Whichever Soi you’re at, there’s a place and activity for you! Soaking Wet: Find the Biggest Water Parties and Fights! 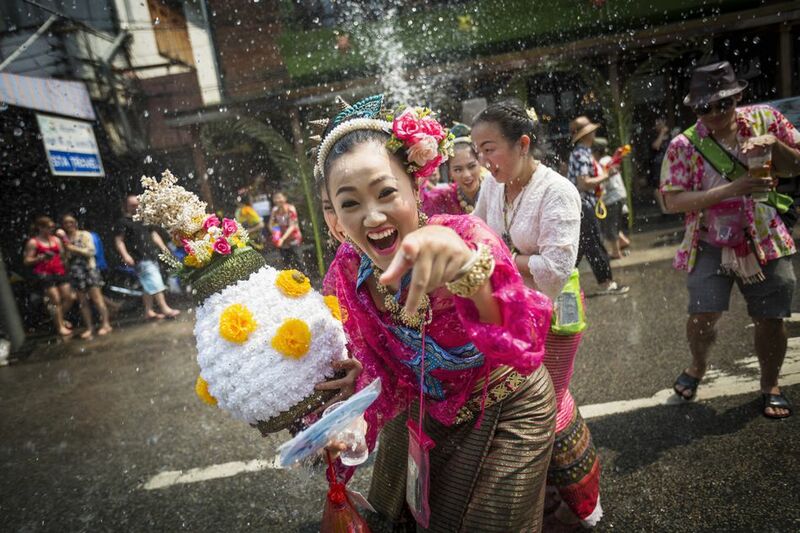 Revellers—locals and tourists alike—engage in street-wide water fights during Songkran. Dive right into Songkran and soak in the festivities at these hot (wet) spots in Bangkok! We guarantee you’ll be awash in joyful merriment, culture and (lots and lots) of water! The largest, rowdiest and wildest water fights USUALLY happen here. Not for 2019 though. No escape from getting wet and messy. You’ll get soaking wet here. Guaranteed. Wild party atmosphere with DJs, bars and drinks. Not for 2019, though. The kaleidoscopic street of Khao San Road transforms into one of the wildest water fights in the city during Songkran! You’re guaranteed to get wet—and that’s entirely the point if you choose to celebrate Songkran here. Getting soaked during Songkran is fully auspicious! The more you get sprayed, the more blessings you will receive in the new year. The street is full of bars and an eclectic mix of people from all over the world, so it becomes one massive wild and noisy party. The whole length of the road becomes a street battleground for rowdy water fighting, and is a huge draw for tourists. Bars often stay open throughout the festival at Khao San road, so (actual) watering holes are aplenty. For the safety conscious, police security is usually tight here. They often set up checkpoints to confiscate dangerous items and contraband. As long as you’re law abiding in your merrymaking, you’ll be all good. In fact, we’ve heard that the police themselves sometimes get in on the fun! After all, Songkran is a celebration for everybody. With Songkran at Khao San Road being toned down this year, we expect the wild craziness will happen at Silom instead! One of the biggest water fights in the city (on ground level). 5km (3 miles) of wild water-soaking festivities. Skywalk keeps you dry while observing the great water fight below. Get hosed down by municipality fire trucks! To truly experience Songkran, you can’t get any better than Silom. To us, it’s the biggest and best place to enjoy Songkran in Bangkok. You can dive right into the water-soaking fun, or observe the mayhem in relative dryness from the convenient BTS Skywalk that stretches overhead. Visit Silom with the expectation that you’ll get wet. Just in case! From there, you can see the massive crowd, faces splattered in coloured clay, engaging in water fights between rows of stalls selling water battle supplies, drinks and street snacks. That said, do visit Silom with the expectation that you’ll get wet, even if you stay exclusively on the Skywalk. That’s because the sheer energy of the festivities often splashes onto (innocent) onlookers. We also highly recommend that you keep your important belongings wrapped up in waterproof bags or gear made just for Songkran! Perhaps the biggest highlight at Silom are the arches of water at the street intersections, provided courtesy of—believe it or not—the fire trucks of the Bangkok Fire Department! It’s just characteristic of Thai culture that even the city officials join in the fun. Their presence also lends the festivities a sense of safety and security. Most locals love their presence, for there’s nothing more relieving than being hosed down in the summery heat. Temples, parades, and traditional merit making. Celebrations at these districts are more respectful and authentic. Many of these customs are becoming rarer year after year, so it’s good to spend a day to visit and engage with them to keep the customary spirit of Songkran alive. Respectful, traditional celebrations at the Grand Palace district. Temple-hop to observe traditional processions, pay respects and receive new year blessings. You are likely to get wet, as receiving water is an auspicious blessing. Great for tourists who appreciate authentic culture and wish to experience it all first-hand. In Sanam Luang, especially the area opposite the Grand Palace, you’ll be treated to spectacular and traditional celebrations as Thai devotees join the sacred celebrations to commemorate the arrival of the Thai new year. The highlight would be the parade of the famous Phra Buddhasihing sculpture. The parade often begins on April 12th, a day before the start of Songkran, where it is taken out of the National Museum and paraded around the streets for the public to pay respects and pray to the Buddha. As is customary, the public will spray and sprinkle perfumed water on the Phra Buddhasihing for blessing. Thereafter, the famous sculpture will be left on display at Sanam Luang for the full 3 days of Songkran. As Sanam Luang is where the Grand Palace resides and home to many of the great temples of Bangkok, it is by far the best place to experience the traditional side of Songkran. The temples are certainly worth a visit during Songkran. Step into any local temple and you’ll find people paying their respects to the Buddha images, washing the statues, and honouring the monks. Join the locals in visiting all nine of these top temples, making merit at each one and securing good fortune and blessings for the new year ahead! This is where the most traditional Songkran celebrations are held, including getting wet in the traditional ways. Witness cultural folk games, customs and traditions that are becoming increasingly rare in Bangkok. Witness grand floral floats parading along the streets, traditional dances and costumes. Water splashing is indeed a traditional custom of Songkran since the ancient Khmer Empire, and here at Phra Pradaeng, you’ll get to experience how they used to do it centuries past. You will witness and join in customary folk games that Thai children play, including the popular Len Saba game that is also a courtship ritual for young Thai men and ladies. You’ll be treated to incredibly jovial and lively cultural Raman dances, which are becoming a rare sight in Bangkok these days. Related: Learn about the Traditions of Songkran beyond the water splashing festivities! For the sweet toothed, you’ll get to indulge in many traditional sweets and treats like “Kalamae”, a sticky candy with rich natural coconut milk and pandan flavours. 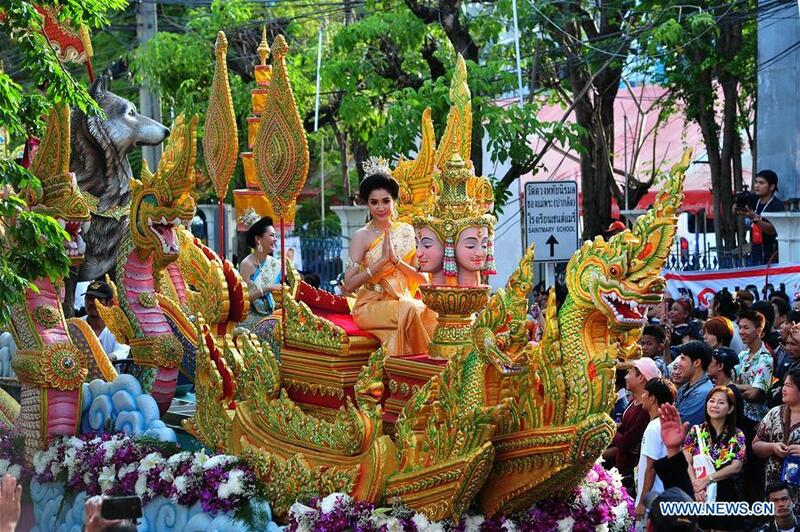 The highlight of Songkran at Phra Pradaeng has to be the processions of grand floral flats. They carry beautiful ladies costumed in traditional Mon-Thai costumes, with the Thai men flanking them the entire way. The parade features between 10 to 20 processions annually. On the last day of Songkran, the procession ends with lots of merit-making. Locals pour lustral water on Buddha statutes and pay respects. During the final procession, each maiden carries a fish bowl or a bird cage, releasing these creatures at the end as an act of merit to bring good fortune for the coming new year. Enjoy Songkran with the whole family at Siam Square! A wholesome place that’s filled with games, activities that are child friendly, you’re guaranteed a great time here during Songkran! Engage in celebrations of traditional and modern in a more chill, laid back and family-friendly way. Mingle with the locals who comprise mainly students and fun-loving folks from all over the country and beyond. Giant inflatable water slides for kids, lots of street food options that line the famous shopping malls. Siam square is the local hub of youth culture, filled with students, fun-loving folks, the young and the young at heart. 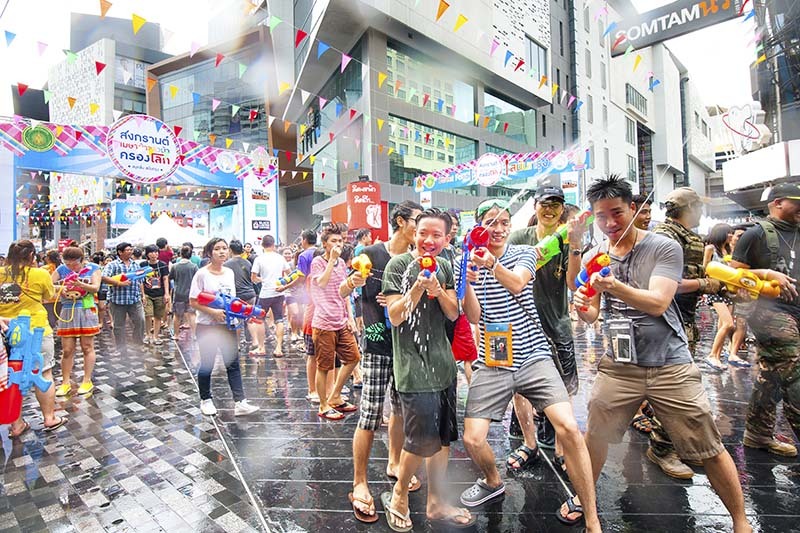 At Siam square, you’ll engage in milder water fights amidst an atmosphere of traditional parades, wet arenas, and live bands playing through out the day. Look out for the giant inflatable water slides that are a favourite for kids! It’s a great place for street food, like sticky rice treats, crispy fried chicken and seafood balls on a stick. It’s the best way to get that Thai experience whilst enjoying the festive vibes of Songkran. That’s not forgetting the great retail and dining experiences that the malls like CentralWorld, Siam Center and Siam Paragon offer here. Siam is a central BTS station hub, so it’s very accessible wherever you’re staying in Bangkok. If you like, it’s very close to Silom where you and the family can witness the more rambunctious water fights there from the relative safety of the overhead Skywalk. All in all, Siam Square is the best place for all-rounded and wholesome Songkran festivities. Watery fun is low-key, cultural events are aplenty and amazing live music fill the air with unmatched festive vibes. Alcohol and messy clay powder are banned here too! What’s Bangkok without a little nightlife? Clubs and bars hit it up a notch during Songkran, and the best place to party it up with water and EDM is none other than the famous RCA. When the sun goes down, the party’s just beginning. RCA in Bangkok is home to many of the best nightclubs in the city. During Songkran, the clubs host special Songkran parties, with top class acts, drink promotions and heaps of fun and ground-thumping beats. As Songkran is in celebration of the Thai new year, some of these parties rival the largest contemporary New Year’s Eve parties. It’s awesome. There’s a Songkran for Everybody! Whatever your fancy and whomever you’re with, Bangkok has lots to offer during Songkran. Wander along any street, and you’ll find something delightfully unique during this period of merriment and merit-making. With three whole days of celebrations, it’s worth it to just experience it once in your life. After all, Songkran is the the biggest cultural phenomenon that has put Thailand on the bucket list of any traveller to Southeast Asia.